How Might We Measure The Impact Of Innovative Change? Once again you are invited to share your own ideas about this week’s blog hop question . . . Inherent in innovation is exploring the unknown. And when we take risks and try new things – or, explore the unknown – we often encounter a higher rate of failure than we are accustomed to. However, we are resilient so we try, and try again . . . and again. We give countless hours of our time in pursuit of our idea. I believe that innovation at its core is the accumulation of small ideas that contribute to a larger idea – an innovative idea that inspires change. I also understand that this process of learning, or pursuing a larger idea requires time. 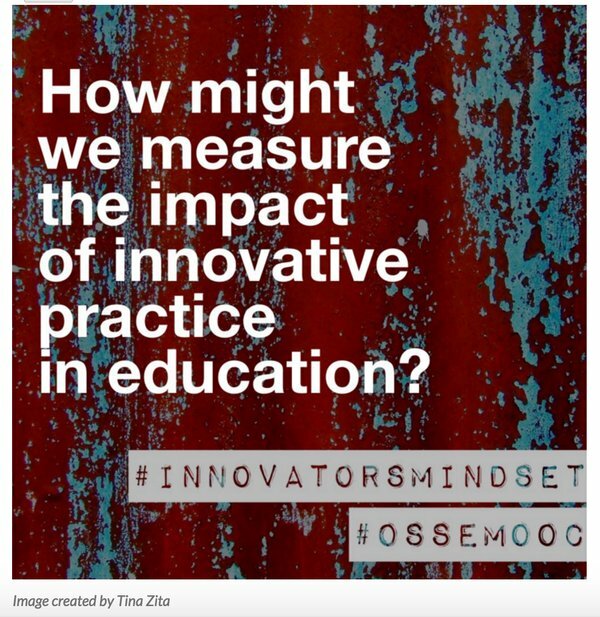 So How Might We Measure The Impact of Innovative Change? We must first be willing to give the process time – and a lot of it. Since innovation is a process that requires time, we need to consider measuring the impact of innovative change over time as well. A portfolio mindset maybe? How are we documenting our learning journey and reflecting/ assessing our work for and as learning to measure the impact of our current practice? Maybe the first question is, are we? Without documented evidence of our own learning, it is difficult to monitor and assess our own growth and the impact our practice is having on student learning. If we continue to take this idea further, we could start to examine the process of goal setting – creating a long term vision for our work, measured by short term goals set throughout the process. And if we start to think on a larger scale now, as we consider measuring the impact of innovative practices within a school, or across a system, one act of innovation might also be measured by another’s willingness to join us in our pursuit of a new idea. When we share our ideas with others we are inviting them to collaborate with us, and the ideas that engage others may also be those larger innovative ideas that inspire change. However, in order for an idea to gain traction and have an impact beyond our classroom within the larger educational community, doesn’t there need to be a first follower? And as the movement gains momentum and more followers join in, we begin to create a movement – the next step towards creating a culture that embraces innovative approaches to teaching and learning. Would it not be reasonable to say then that one way to measure the impact of innovative practice throughout a school or across a system is in part dependent on empowering others? I believe that the glue that binds people together is productive collaboration. If we are measuring whether an innovative idea has had an impact, we should always begin by asking, is this best for kids? Not all ideas that have an impact are necessarily “best for kids”. As we set goals, achieve goals, document and reflect on our own learning journey, we also need to consider whether a particular practice is, and should be sustainable. Measuring innovative practice is the only the beginning – the potential for the making of a movement. Maintaining and measuring sustained innovation is about creating a culture – a culture that embodies the innovators mindset with a focus on doing what is best for kids. Interesting to see the common threads of small changes, culture and a reflective stance in each of our posts. Thanks for the read Leigh!